Open your Telegram APP and search for "BotFather". Give your bot a nickname and username (e.g., nickname: TestingABC and username: TestingABCbot <-- username has to be ended by 'bot'). Save your bot API token (e.g. 227330911:AAEWHnT9B9bAARDiKhESwXd7hk-G4nxmEpI) and click t.me/TestingABCbot to chat with it. Back in MetaTrader 4, go to Tools > Options > Expert Advisors > tick 'Allowed WebRequest for listed URL' and add 'https://api.telegram.org'. 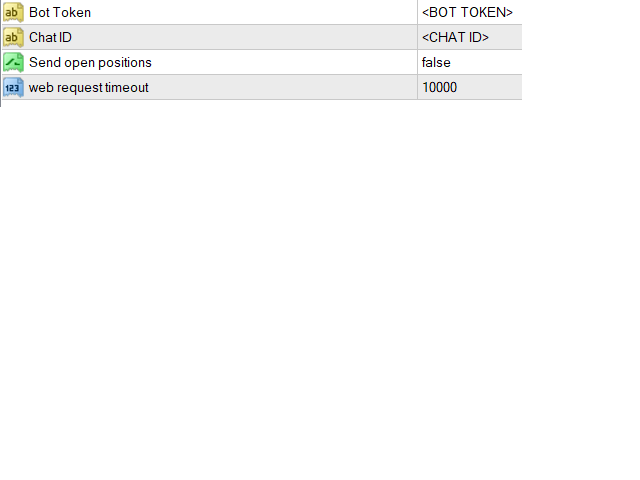 Attach the utility into your MetaTrader 4 chart and fill up the Bot Token (from step 5) and Chat ID (from step 10). This EA does its job. Had an issue with open orders. But the developer fixed it like in 30 minutes when i reached him. Overall support and performance is highly impressive. I would recommend this if you would like to share your signals to a group/channel.